Moving On Center was founded on a dream. In 1958, Carol Swann was six years old when her mother was incarcerated for the first civil disobedience act against nuclear weapons. Growing up in an era of social movements infused with traditions of folk singing and folk dancing, her childhood was steeped in galvanizing community energy. Carol dreamed that if everyone could sing and dance together, there could be an end to war. Carol’s parents life-long commitment to Social Justice through Non-violence led to founding the New England Committee for Non-violent Action (CNVA) in 1960 on a 50-acre farm in rural Connecticut. This became a center for mobilizing movements and actions for large scale marches, peace walks, fasts, draft and military counseling, war tax resistance, civil rights, gay rights, military base conversion, economic alternatives and co-operative living. Carol grew up with a deep sense of the interconnectedness of the personal and the political. She became astutely aware of how “change” could not be imposed on others without “change” first becoming an ongoing “self-examined” and “embodied” process within oneself. After many years of political work, teaching, performing, training and practice in various dance and somatic modalities (specifically in the movement re-patterning and psychology fields), Carol decided it was time to bring her childhood dream of an alternative educational institution into being, here, where she had moved, in California. The basis was to reveal a “Socially Conscious Body” – one where personal change, social change, somatics, process arts, and the improvisational mind were all part of one weave. The institution needed to be a collective endeavor, a model in co-operative effort and co-operative learning. She was fortuitously introduced to Martha Eddy, longtime Somatic teacher, practitioner, performance artist and politically-minded kindred spirit. Martha also came from a family of activism and service, but based in the urban environment of New York City. Martha had already founded the “Somatic Movement Therapy Training” (the first training program to use the term “somatic”, now called “Dynamic Embodiment-SMTT”) that ran for a year in New York. They decided to use the MOC training program as a pre-requisite to participate in the DE-SMTT training, thereby partnering the programs successfully into future years. The support was building. Mark Griffith, a dancer and arts administrative master’s candidate and Jon Weaver, a local choreographer and teacher, were invited to join the project. All four co-founders shared common values around the Arts and Somatics as essential vehicles for social change. Then began a two-year process of visioning, developing a mission, a curriculum, and a business plan, which led to incorporation as a non-profit in 1994. 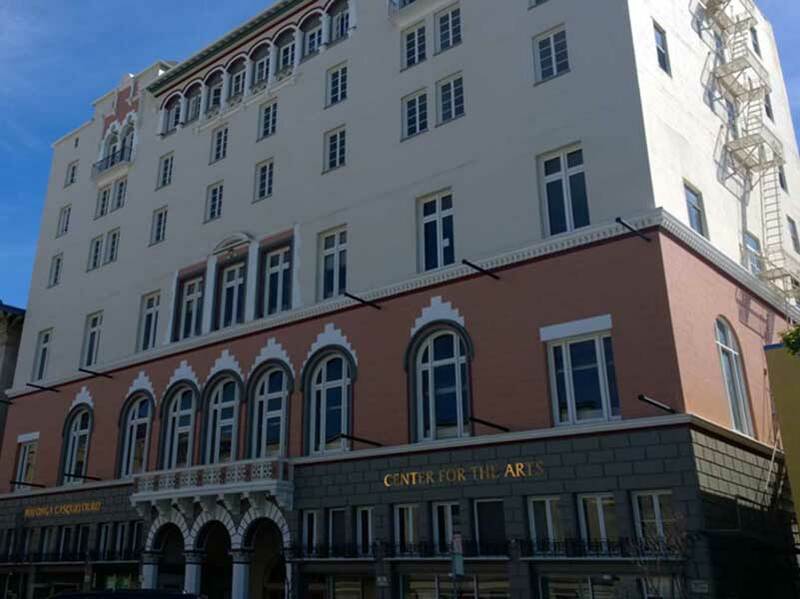 The school was deliberately located in the Alice Arts Center in downtown Oakland (now the Malonga Cosquelard Center for the Arts) in order to be a part of a multi-cultural community environment. As the dream began taking on shape, a recruitment strategy was necessary. Outfall, a weeklong summer intensive offered the solution. Carol organized Outfall in Santa Cruz over the course of three summers, inviting teachers both locally and from Movement Research in New York (where she had served as Executive Director from 1981-83) to teach a dynamic movement and somatic based training-ground. MOC began as a nine-month training program, five days a week, eight hours a day. It was deliberately housed at the Alice Arts Center (now the Malonga Cosquelard Center) in downtown Oakland so as to participate in a multi-cultural community environment. Our student body has always been a fantastic melange of people from many countries and many states, as well as local residents. Ages range between twenty years and fifty years. Eventually we included two scholarship slots: one for a student from a developing country, and one for a student living locally in Oakland. In those first three years, we established a lot of ground. 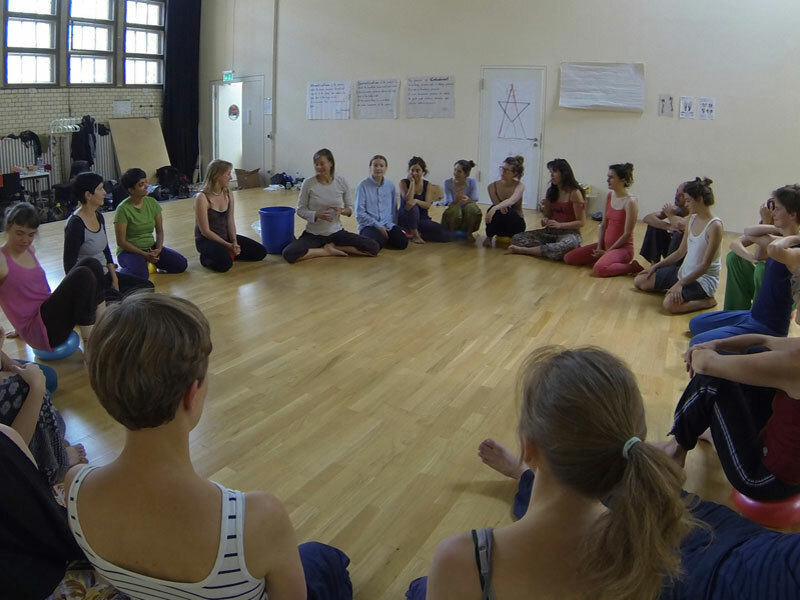 We re-organized our entire curriculum after the first pioneer year and created an exchange program with one of the most well-known experimental new dance schools in Holland, The European Dance Development Center, in Arnhem, Netherlands (EDDC). We became a non-profit sponsor to artists and artistic projects including the West Coast Contact Festival and provided essential support for securing grants and fiscal guidance. And very importantly, we added a two week 150 hour Massage Training program in collaboration with Mind/Body College of San Diego and then Alive and Well Institute of Conscious Bodywork which not only provided a way for students to integrate their Somatic learning into a specific practice but it also gave students an immediate working income once they graduated! We also saw the departure of three of the co-founders. Responding to job offers and loves in other states, Mark, Jon and Martha all left California. Although living afar, Martha (who teaches in the program every year) and Mark continue to be an integral part of the development of MOC both as Board Members and collaborators. MOC continues to fulfill the pre-requisites for students who choose to participate in Martha’s DE-SMTT training program. After three years of the full nine-month program, we took a year-long hiatus. Bill McCully came on as my Co-Director and we investigated offering more affordability and sustainability. Grants had started to disappear. George Bush clamped down on independent schools and programs by banishing part-time visas. 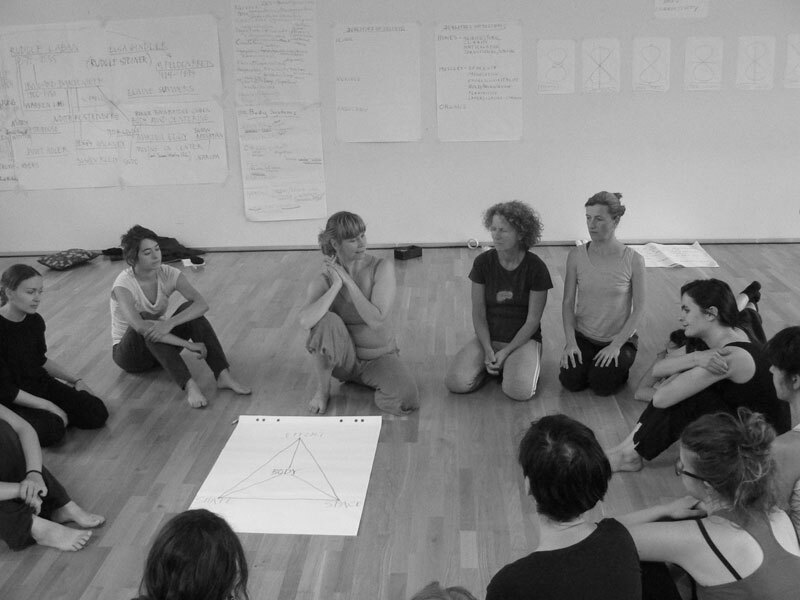 We downsized into a three-month program that continued to integrate somatics, performing arts, and social change. Two years later Peggy Hackney became my assistant Director. Peggy served for four graduating classes. During this time, we developed a low-income student loan process from an alternative Community Credit Union based on the Grameen Micro Loan idea developed in India. We initiated a “Free Clinic” in the building, inviting people working and living there, people from the streets and the neighboring area to come in for Somatic Bodywork. Bodywork was lovingly provided by students, allowing them to serve the community and accumulate practice hours. The Free Clinic provided service for three years. Susan Bauer became the next Program Director as we entered a new phase. To make MOC even more accessible, we separated the three primary subject themes into independent modules: the Somatics Module #1, the Socially Conscious Body Module #2, and the Improvisational Mind and Performance Module #3. By 2008, as the economy crumpled, our core student body dwindled to a smaller and smaller group of students. Our workshops remained full but the base became too small to financially sustain us – we needed to close. So we graduated our last class, said goodbye to our long-standing friends from other organizations in the building, packed our boxes and took our leave. Although MOC went into hibernation, Carol continued to teach in Europe and Latin America and to develop ideas for satellite trainings. A seed took hold in Berlin, Germany, in the summer of 2013. At Carol’s invitation, Satu Palokangus, a former graduate, organized and co-facilitated the Somatics Module. 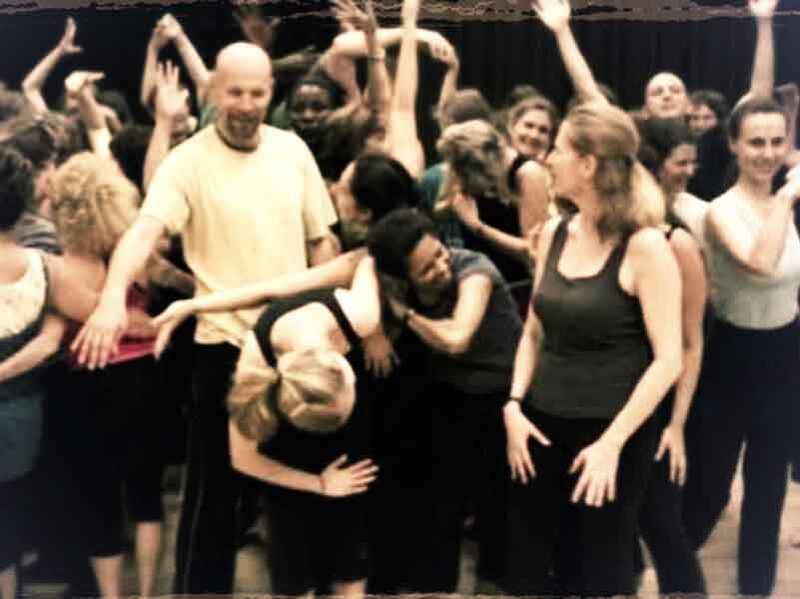 Other graduates and teachers joined the teaching team and we held the training (running for two successful summers) at the Uffer Studios, sponsored by Tanzfabric, a venerable dance and performance space. The Phoenix rises once again back in the West! Our good friend Joanna Haigood, a renowned local artist, founder and director of ZACCHO Dance Theater for 35 years, recently invited MOC to San Francisco under her sponsorship. 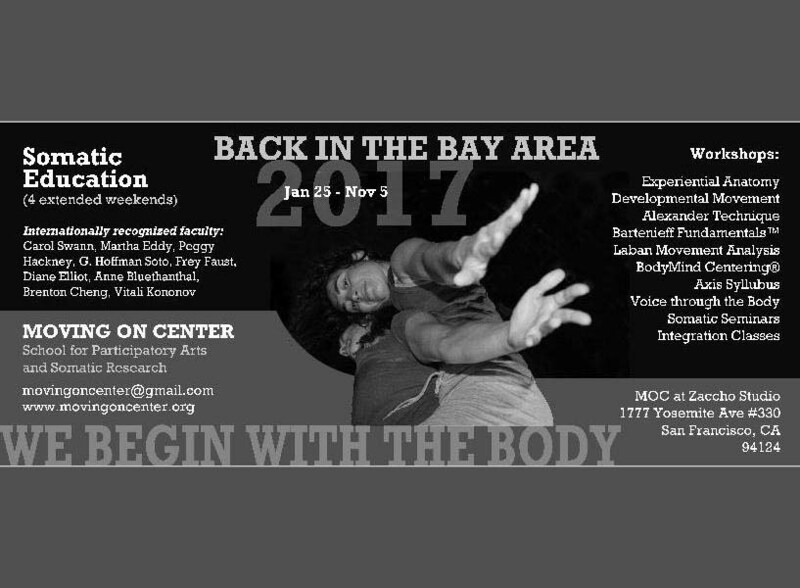 As MOC returns to the Bay Area to begin its 17th year, we offer the Somatic Module curriculum in an accessible format of four extended weekends beginning January 2017! This is where you, the reader, jump in! If you’ve ever considered a training in Somatics, we invite you to be a part of this ever-evolving field and our ever-evolving program. We look forward to this fresh chapter, this beautiful venue, and a new group of curious and exciting students. We welcome you!